Newburgh Arts and Action a new monthly mixer/meetup for Orange County artists and creatives had its kickoff meeting this September 2018. The meeting was hosted by Newburgh’s letterpress printer Thornwillow Press at their Thornwillow Institute, a nonprofit which promotes the art of craftsmanship in all its forms. Thornwillow is in a spacious warehouse located on S. Lander Street; it was a perfect space for the event. As several dozen artists mingled and chatted for a solid 45 minutes, wine and small bites were served up (cash bar and food) by Café Macchiato, a Liberty Street restaurant that, like Thornwillow Press, and many others was an early mover in spurring Newburgh’s resurgence. Linda Marston-Reid, Executive Director of Arts Mid Hudson, an organization that helped spearhead the meetup, was on hand and noted that Newburgh was selected based on its location and its dynamic, emergent art scene. (Newburgh is a transportation hub centrally located within Orange County, near interstates 84 and 87 as well as local routes 17 and 208, making it easily accessible. A ferry also runs between Beacon and Newburgh). Also on hand was Gary M. Schuster, Esq. – Jacobwitz & Gubits, LLP, Partner and a board member of the Orange County Arts Council. Schuster is also a board member of NYCON, The New York Council of Nonprofits which works with members on the issues nonprofits face. Orange County Arts Council President Stuart Sachs, a noted artist and a professor at Pratt Institute, spoke to the audience about the purpose of the meetup and also mentioned that a new Executive Director for the Orange County Arts Council has been hired, Sarah McKay. Generally, Sachs explained the primary goal of the meetup is to provide Orange County creatives with an opportunity to meet and learn about arts-related activities, opportunities and possible collaborations in the community. He emphasized such meetups are valuable opportunities for anyone involved in the arts in the Newburgh/Orange County area. Michael Gabor and Gerardo Castro also spoke about Newburgh Open Studios, the studio tour of Newburgh Artists’ studios, art galleries, and some commercial real estate spaces that are made available to artists wishing to exhibit for the tour. This year’s tour took place the weekend of September 29th and 30th. Partners Gabor and Castro own Newburgh Art Supply and have organized the hugely successful Open Studios event for the last eight years. Eric Jarmann spoke about Gritworks the co-working space he runs and its availability to partner with creatives as well small businesses in the community. Future events will again feature a social period before moving on to an evening agenda. Future speakers will address grant and other opportunities. 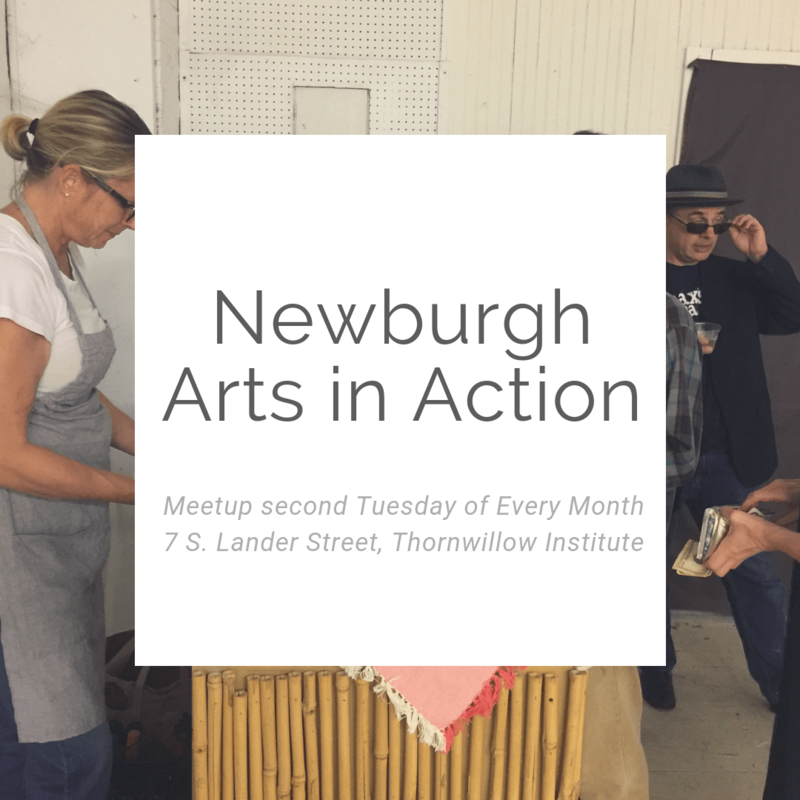 Newburgh Arts & Action mixers will take place on the second Tuesday of the month and for the next few months will be at Thornwillow Institute, 7 S Lander St, Newburgh, NY. Food is available for purchase and provided by Caffe Macchiato. This event is free and open to the public. RSVP requested but not required: Follow it on Facebook to stay up to date! In addition to Arts Mid Hudson, the Orange County Arts Council as well as Safe Harbors, Newburgh, Newburgh Art Supply, and Gritworks, all worked together to launch and support the meetup.